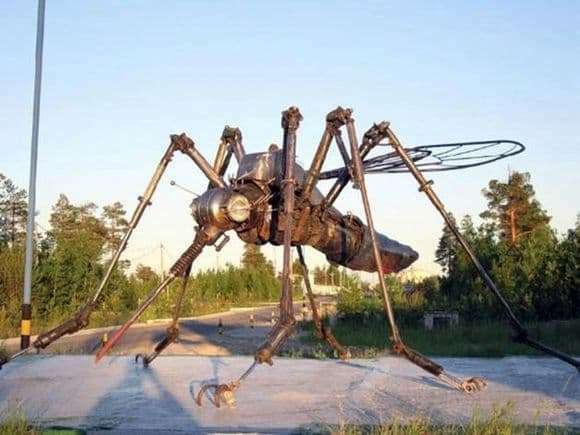 More recently, in two thousand sixth year in the city of Noyabrsk, a mosquito sculpture was constructed. Its location: the park of veterans in the settlement of Ladnoy. But this monument has already gained popularity among the population and tourists. Those who want to be photographed with an impressive size mosquito a lot. And the size of the insect is really impressive. Its height is two and a half meters, and its width is three. The sculpture is made of metal structures that look more like waste of iron parts. But it is not so. The author of this work is considered to be the sculptor V. Chaly. Before constructing a mosquito, he assembled metal parts for eight months that were no longer suitable for use. Then it took a lot of time to cut and grind them to the required size. All parts were welded by conventional welding. And the figure of the mosquito turned out even funny. The first impression the sculpture produces is frightening, since not everyone has met with an insect of such enormous size. Yes, the whole construction weighs one and a half tons. Created this monument, as a kind of action. And not because the mosquito is a cult insect. All the way around. People for a long time could not get rid of mosquitoes, which were very much in the Siberian town. In the summer I couldn’t save them; they flew in whole swarms. Some people said that they endure cold winters better than summer with these insects. Only insecticides could cope with mosquitoes, but they also had to be abandoned, because they cause harm to the surrounding nature. Yes, and completely destroying insects, you can destroy the birds and fish. Since they eat mostly mosquitoes. Therefore, people have to put up with such a neighborhood. The delight and admiration is more a sculpture for children. But the locals believe that by remaining in such a place, they managed to conquer nature.